Boston Terrier should be that of a lively, highly intelligent, smooth-coated, short-headed, compactly built, short-tailed dog of medium station, of brindle colour and evenly marked with white. Not exceeding 25 lb(11 kg), divided by classes as follows: lightweight, under 15 lb(7 kg); middleweight, 15 lb and under 20 lb(7-9 kg); heavyweight, 20 lb. and not over 25 lb(9-11 kg). 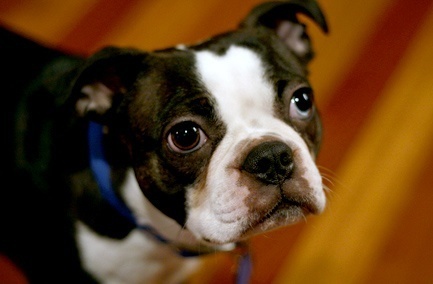 Intelligent, playful and good with kids, Bostons are clowns – but they can also be stubborn! Patellar Luxation (loose kneecaps) is a common problem that sometimes requires surgical correction.